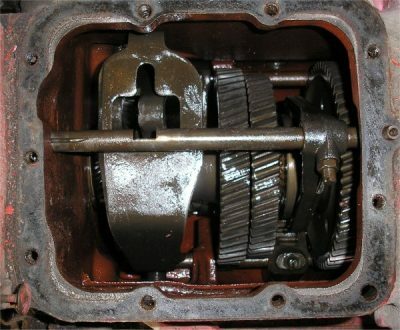 One of the complaints we hear about now and then is a 4 speed transmission that “locked up” when it was shifted from one gear to another. The transmission is actually engaged in 2 gears at once. It can be several combinations, but 2nd and reverse seem popular. First, is the “why” it happened and the answer is simple. 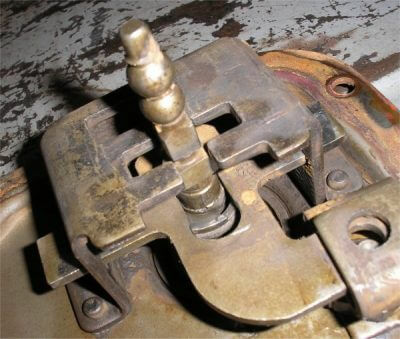 Wear on the shift gates and/or the shifter lever and guide pin combined with sloppy shifting practices. This photo shows the bottom gates on a shifter cover. These are in excellent condition and show no wear. A tractor with shift gates in this condition will NOT get stuck in 2 gears at once. This picture shows the end of the shift lever is also in great shape with no apparent wear. Most will not be this good and some will be severely worn. That’s where the trouble starts. The shift pattern on the tractor is an “H” pattern. Always shift gears using the straight direction of the “H”. Push or pull the lever straight to neutral and feel it snap in before moving on to the next gear choice. This practice will assure you will never be stuck in 2 gears at once. Pushing the shifter toward one side or the other and pushing it forward or back at the same time to let the gates do the guiding will get you in trouble when the gates are worn. You’re not driving a sports car. If you do find yourself in this unfortunate position, it does not necessarily mean disaster. You shift gears, let out on the clutch, and realize it’s locked and won’t move. Stop right there! Do NOT rev it up and “pop” the clutch, do NOT jerk it, rock it, bang it, or slam it. Do NOT hook a chain on it and drag it anywhere. Brute force is NOT the answer. Any actions of this type will guarantee broken gears and serious transmission damage. Just turn off the tractor, and remove the shifter cover. Here’s what you see with the top off when everything is in neutral as it should be. Notice how the slots for the shift lever are all in line with each other. That’s where you need it to be to get the transmission back to neutral. 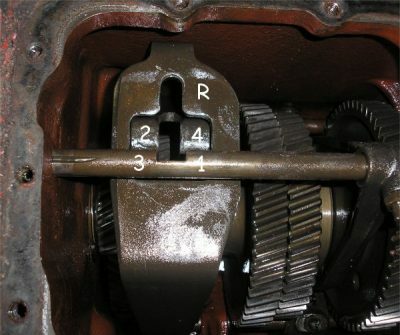 1st and 3rd gears work directly off the top rail. 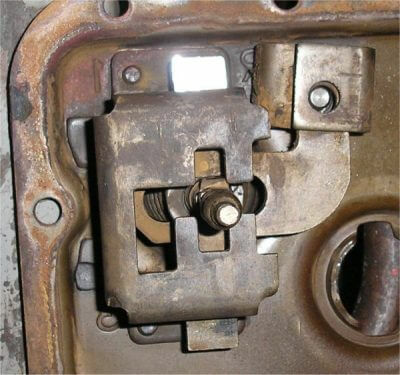 2nd, 4th, and reverse are actuated by the plates which in turn move the lower rails and forks. The 4 speed gears are fixed in position and are engaged by a sliding collar that goes onto the dentals on each gear whe it’s selected. 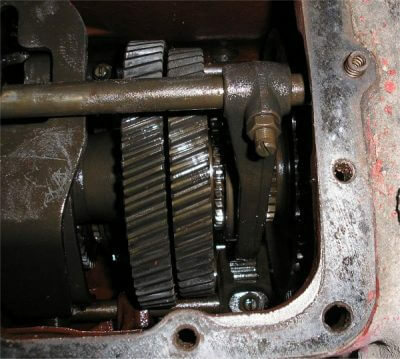 This picture shows the lower plate shifted to the 2nd gear position. You can see it’s way out of line now with the other two slots. Here’s a picture of the 1st and 3rd gear shifter fork and sliding collar. It’s not engaged with the dentals on either side of it so it’s in neutral. Here’s a picture of a transmission with the upper main shaft removed so it’s easier to see the lower shaft with 2nd, 4th, and reverse. All are in the neutral position. This is how you need it to look to get the transmission back in neutral again. 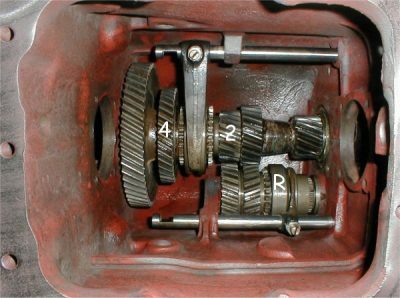 The problem is that when 2 gears are engaged at once and you let out on the clutch, the transmission input shaft starts to turn and the 2 gears with different ratios bind up tightly against each other, locking the transmission. You can try to pry the sliding collars off the dentals and back to the neutral position, but they can be extremely tight. Most times you cannot pry hard enough to get them released. You have to relieve some of the tension on them before you can move them. Again, brute force is NOT the answer. Jacking up the rear end of the tractor rarely helps because the binding came from the front of the transmission. The answer is fairly simple. Disconnect the battery for your safety. Now rotate the engine backwards (counterclockwise looking at it from the front). This will turn the transmission input shaft backwards and release all the pressure that was on the 2 gears so you can easily slide the shift collars back to the neutral position. If the fan belt is good and has a good grip on the pulleys you can turn the engine backwards using the fan. If you can’t get it to move enough (one revolution is usually more than enough) you may need to find another way such as removing the starter and turning the flywheel with a screwdriver in the ring gear teeth. Keep checking the shift collars in the transmission. When the engine has moved backwards far enough the collars will be free and you can position everything back into the neutral position. Then you simply need to install the shift cover and get back to work. If you stopped in time and did not get rough with it, there should be no damage. If you originally heard a loud bang when you let out the clutch or you got rough with it while trying to get it free, you’ll be buying some new gears for the transmission. Replace the shifter cover with one that isn’t worn or just be sure to shift it carefully and you won’t have a problem again.